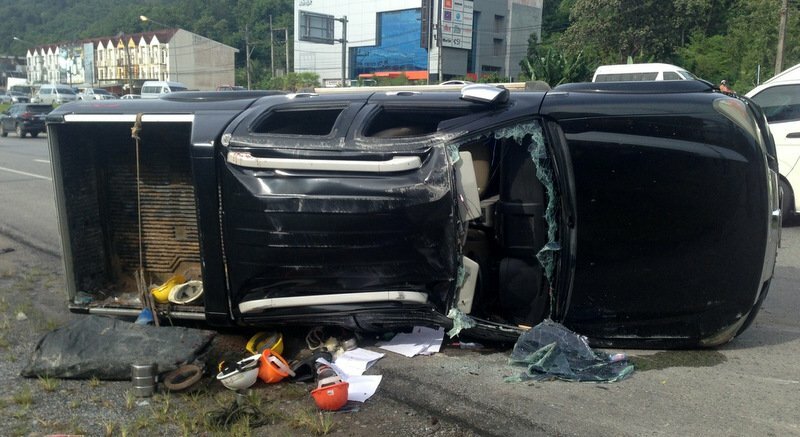 PHUKET: A pickup truck carrying carrying Myanmar migrant workers in the tray overturned on the bypass road during rush hour this morning (Nov 15), leaving at least one dead and seven injured with the victims left strewn along the busy road. 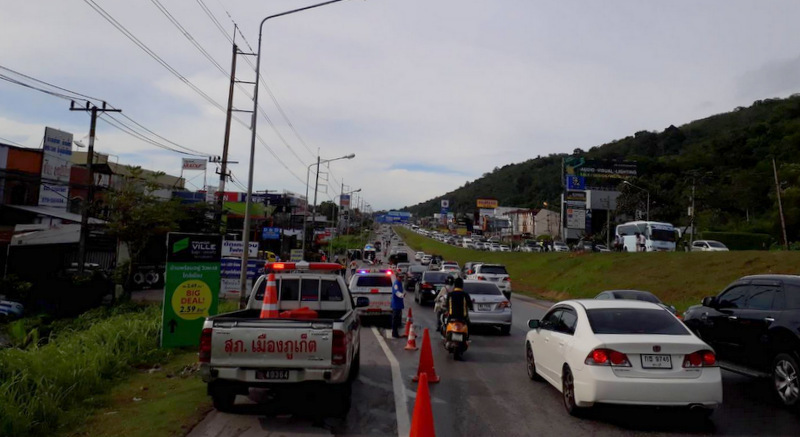 Phuket City Traffic Police reported that the pickup truck overturned in a single-vehicle accident on the southbound lanes about 100 metres from the Keehin industrial machinery depot at about 8:20am. 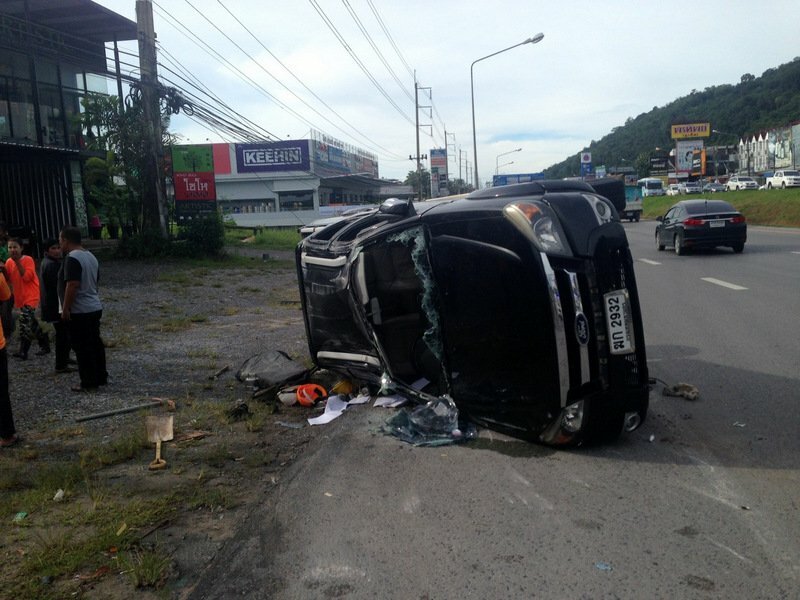 “At the scene we found a black Ford pickup on its side,” Capt Bancha Kuenun of the Phuket City Traffic Police told The Phuket News. 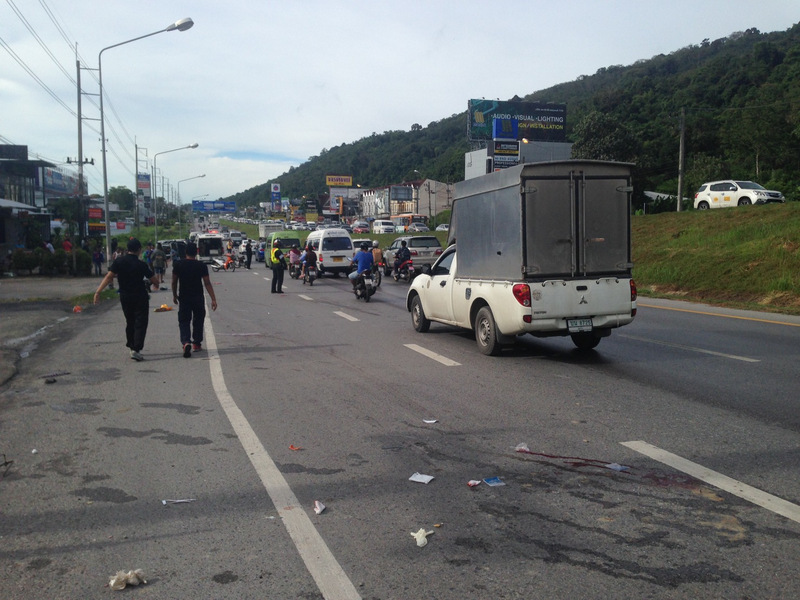 All of the injured workers and the body of their colleague were taken to Vachira Phuket Hospital, Capt Bancha. “The driver and the passenger in the cab are both Thai. The passenger suffered only minor injuries. However, we have yet to determine what caused the accident,” he said. The accident caused long traffic delays along the road, which serves as one of the island’s busiest arteries. “Traffic Police are at the scene to help direct traffic past the accident,” Capt Bancha said. "We are yet to determine the cause of the accident"..Gee let me think, speed, recklessness, stupidity, disregarding conditions & other motorists, lack of road rules and zero enforcement of them, no accountability, take your pick! This is infuriating. We see it every day...workers over-packed into some piece of crap truck driven by some freeking moron that has no concern for these poor workers. Oh, and that silly law that popped up about passengers in back of trucks...forget about it. Surely this tragedy will give cause for action...but wait!, I forgot, Thai officials don't take any action, especially about road deaths.